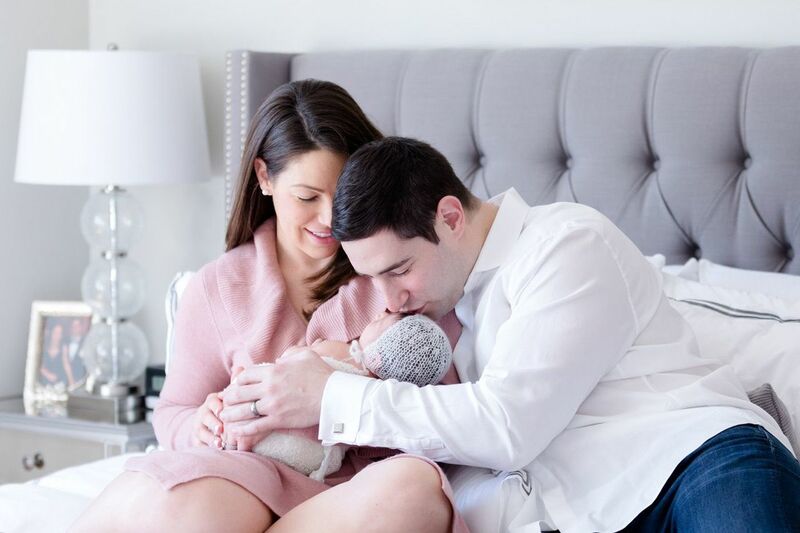 Rachael and Justin Pines with daughter Amelia Rose. THE FIRST SIGN THAT RACHAEL WAS PREGNANT: Even before she took a test, she announced to Justin that she was "done with salad," the go-to lunch she'd relished nearly every day for 10 years. When Rachael was pregnant, they called the baby "Major," a nod to how a financial adviser had referred to their still-hypothetical offspring when they sat down to do some long-term planning. "Are you going to have kids?" the consultant asked. This was before graduate school, before the wedding, before they bought a house in Fishtown. "We said yes — probably two," Justin recalls. "The adviser was helping us plan for the future, to think about education, college and savings. He said, 'Let's start with the first one. I'm going to call him or her Major Purchase No. 1.' We both had a good laugh." At the time, parenthood was an appealing but remote scenario. "Justin said 2019; I said 2018," Rachael says. "We weren't totally certain about the timeline." What they were certain about — almost from the first "hello" on JDate.com — was each other. They talked by phone and email for two weeks before meeting at Barbuzzo on 13th Street; Justin lived in Old City, and Rachael, then based in Baltimore, was in Philly to celebrate her grandmother's 85th birthday. Justin fretted over logistics: "Do I drive? Do I pick her up in a cab? Do I meet her at the restaurant? I didn't want to mess it up." But within a short time, they'd vaulted past small talk to discuss their relationship to Judaism — both were culturally connected, but not religiously observant — and their open-minded spirituality, including Rachael's recent visit to a medium. They also discovered their lives chimed in unexpected ways: her family was from Philadelphia but had moved to Baltimore; his did the opposite. He went to college at Northwestern University; she attended Northeastern. "It was not a superficial conversation," Justin says. "I remember thinking: This is, like, it. I'm good. I don't need to go on any more dates with anybody, ever." Rachael wasn't quite as sure. "I knew I could see myself in a long-term relationship with him, but we lived in separate cities. I was more apprehensive, but deep down I wanted it to work, very badly." For a year and a half, they remained long-distance, regularly navigating a 100-mile drive that, Justin believes, helped strengthen their relationship. "We were always very eager to see each other," he says. Rachael was planning to move to Philadelphia in September 2013. Two months before that, on a visit to Baltimore, the two wandered up to Federal Hill, a scenic park overlooking the city's harbor. "I'd had one of my best friends set up a cooler with champagne and ice," Justin says. "I had the ring with me. Rachael was taking a picture, and I got down on one knee. When she turned around, she thought I was hurt: 'Are you OK? What are you doing down there?' "
They married two years later, in Baltimore, in sight of the point where Justin had proposed. The day held indelible moments: when Justin was getting ready with his father, Rachael's father, and best friends from across the span of his life … when they relished a few moments of solitude just after the ceremony … when they showed off their dance lessons with a choreographed routine to "At Last" by Etta James. Rachael completed the nurse-practitioner program at the University of Pennsylvania; Justin got a master's in business. They had the house. They were ready. "I had this huge fear that conception was going to take forever," Rachael says, but they'd been trying for just two months when she presented Justin with a jewelry box containing four pregnancy tests, all unequivocal. "It was an easy, wonderful pregnancy," Rachael says. "Weird at first, but very cool, to have my body changing, to see ultrasounds of a human being in there." As an NICU nurse, she knew too well the dozens of ways a pregnancy could go awry, and she tried hard not to play out such catastrophes in her mind. It helped that Justin has the opposite tendency. "I have a pretty strong belief to trust the universe," he says. "The right things will happen." In this case, the right things did — albeit 16 days before they were supposed to. Amelia arrived early, before Rachael had a chance to ratchet up her anxiety about the pain of labor, just when she was starting to feel mournful about the end of pregnancy. "I got really sad that she'd be out in the world, and I wasn't going to be able to keep her safe. I was excited to meet her, but also bummed that I wasn't going to feel her doing the backstroke and flipping around." Justin anticipated the birth with equal parts curiosity — "What is her little face going to look like? Is she going to have hair?" — and dread, remembering the 10th-grade film about childbirth that had made him woozy enough to leave the classroom. But the actual birth was swift and slow, chaotic and peaceful. Rachael abandoned the meditations she'd learned in her mindful birthing class but remembered to breathe in rhythm; Justin breathed along with her. Time stilled when the baby emerged: a purplish, limp infant with the umbilical coiled around her neck. There was a 10-second silence that felt eternal. And then, a cry. The first two weeks of Amelia's life were a sweet oasis, even if Rachael and Justin were trading off times to sleep, feeding the baby around the clock, and falling asleep every time they tried to watch Moana. It got harder for everyone when Justin went back to work. Rachael spent all day alone with a fussy baby, and Justin inevitably returned from work at his daughter's most disconsolate hour. What helps is a strategy from that mindfulness class: Stay in the present, whether Amelia is screaming with colic or giggling on their bed. The same mind-set that got Rachael through labor can now steady her through life. "In the really tough moments," she says, "and the moments of relief, everything is temporary."